To bridge the gap between Soft Skills and Hard Skills, to create an optimum balance of Art, Grace and Power; and make our game more appealing to the masses. I acknowledge and understand that, there are more than one way of doing and seeing things. This does not mean that the way Coach John or Coach Mike coaches is wrong. My intention is not to undermine or criticize any coach or player personally, for that matter. I just like to show and share the things, without prejudice, from a different angle and perspective. 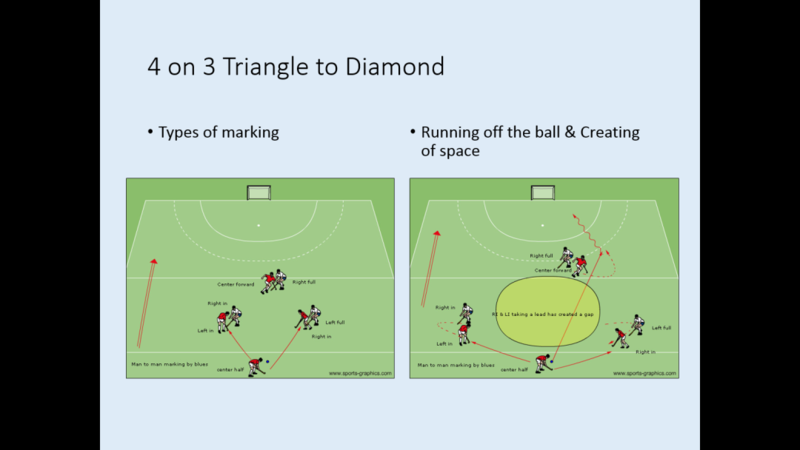 In the CNL # 1 we covered the topic of “Thinking Strategies to play in the Four Quadrants of the field”, in this section, we will zoom the focus upon a specific pocket of the Right Offensive Quadrant, named “Play making space” (PMS). 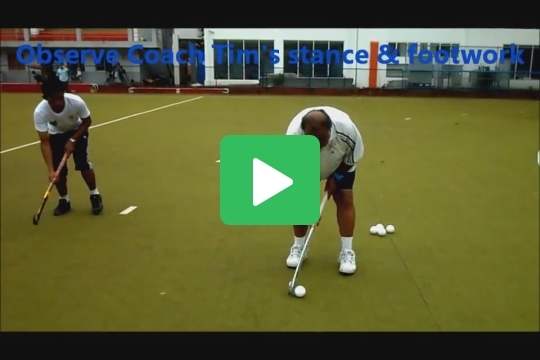 Its role and the strategies to maximize the advantages from the offensive point of view. Coaches have divided the field into various zones to achieve team performance objectives. There are certain zones which are more valuable than the others. It is vital, to be aware and understand the varying importance of each specific zone - Concept of Location and the Player Position – to optimize its advantage. Where is PMS (Play Making Space) Located? PMS (Play Making Space) is located in front of the opponent's circle, towards the right side. The player playing in this position is named Right Inner – Inside Right or Right Link - and plays a key role of a play maker. The passes generated from this space to the leading forwards result in classy field goals. Diagram 2: Positions of the various players on the field and the passing options of the Right Inner. WHY IS THE PLAY MAKING SPACE SO VALUABLE? 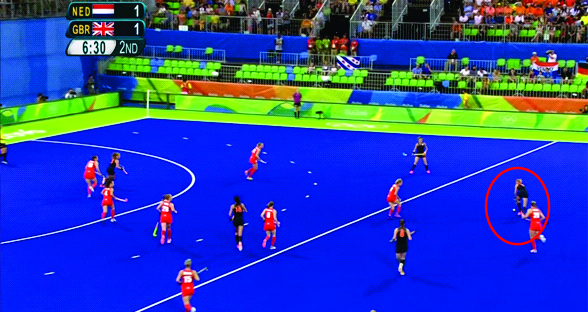 During the 2016 Rio Olympic Games Final match, the defending Olympic Champions Netherlands, had the ball in the play making space, and GB was defending. Please study the picture below. I see this situation as a highly favorable one with a golden opportunity, for the Dutch to exploit the GB defense. For more details of what happened and what should have happened. Please click on this Power Point Presentation. As we dissect this game situation from the point: How the Dutch Right Inner saw the Game Situation Pattern, and how she and her teammates read it collectively to create a goal scoring opportunity. Their strategic actions and decision were not the wisest, while disobeying the basic concepts of attack; Width, Depth, Support and Penetration. By reconnecting with the past we can solve our current day challenges. You will be surprised to know how many valuable treasures are hidden in the past. Please click on these 2 video links from the early 80’s and 90’s. 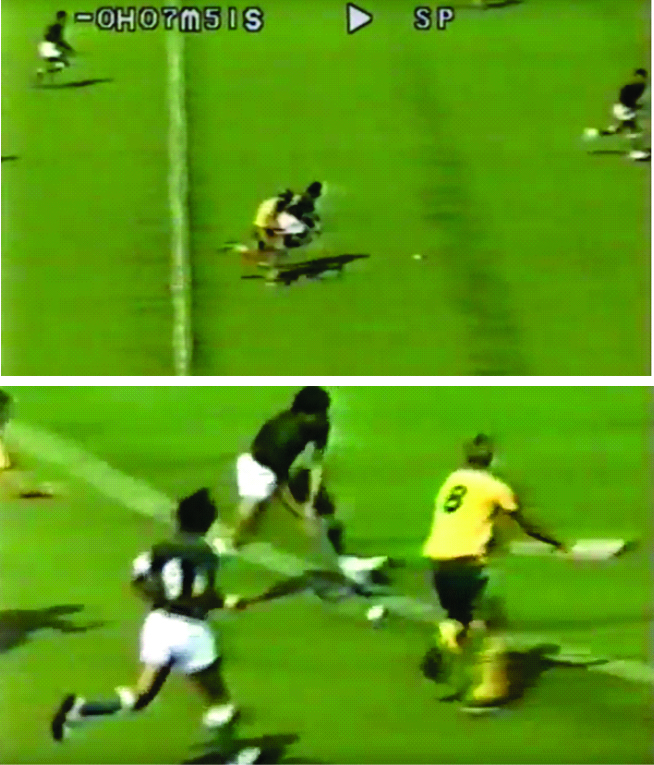 They depict how Pakistan Players intelligently exploited the play making space to win the 1984 LA Olympics and 1994 Sydney World Cup, Gold medals. BTW, these were their last world level tournament wins. One can also say that, one of the reasons for their down fall, was their sharp diversion from their core strengths which gave them the winning edge. In the previous issue we suggested, “While developing a young player’s technical skills, we also need to develop their tactical thinking and game sense to make wise decisions, during the run of play”. IOW teach the technical and tactical skills in the context of the game. So the players may learn to combine their technical skills with tactical decision making ability, under realistic pressurized game situations. Please show these 2 game situation slides to your players, in the U 14 – 16 age group. Question them if they can correlate them from the conceptual thinking point of view. They were taken 28 years apart – 1984 LA Olympics and 2012 London Olympics. The basic concepts of the game have not changed. What has changed is the way we look at them. Since the beginning of this millennium, the role of the Right Inner as a play maker, to the leading forwards has been fading gradually. Partially due to the No Off side Rule (NOR) after the 1996 Atlanta Olympics. This is a point to think over, both for the coaches and the players, on how to best utilize the play making space to the team's optimum advantage. 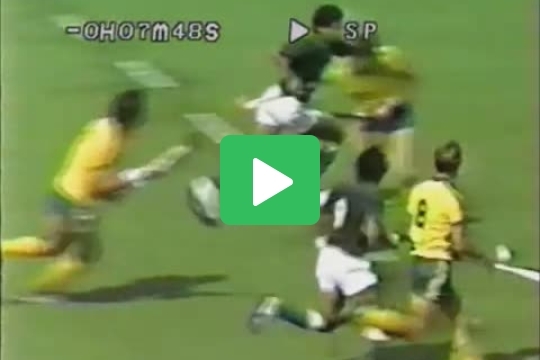 There is no question that the No Offside Rule also encouraged the hockey gurus, to design game plans, which bypassed midfield play and diminished the role of the midfield players to a high degree, replacing it with a Hit and Hope Strategy. This has done our game more harm than good. It has stolen its beauty. Let’s work together to bring a balance of soft and hard skills in our game. Start the revolution from the bottom rather than from the top. Juniors are our big hope. And this is all this CNL is about. In CNL # 1 we covered the role of open stick near the left foot of the body. 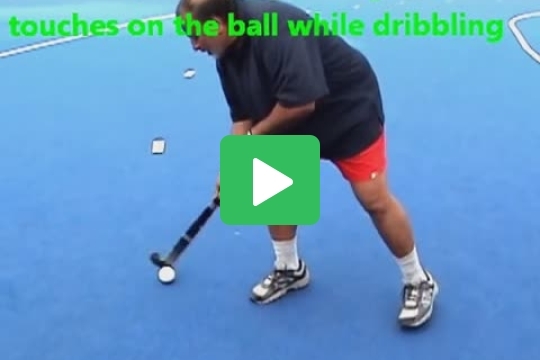 In this issue we will focus upon the role of the reverse stick and how its implementation can be optimized, during the run of play, in various game situations. As we know, we cannot use the back side of the hockey stick, as is allowed in ice hockey. 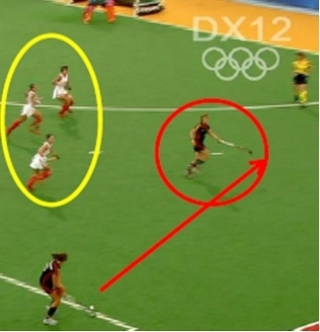 So the stick is rotated back and forth in a semi-circle to control the ball. The players do it well. Following are the game situations, where when applied it can harvest rich dividends. I understand, the players these days do not use it as much as they should or can, due to the fear of losing the possession of the ball, while receiving it under pressure. They are hesitant exposing the ball, and over protect it. There is a time and place during the run of play, when one has to take calculated risk and expose the ball to entice the opponent. Another big advantage is when one uses it to receive a pass coming from the right shoulder – R.I. pass to C.F. 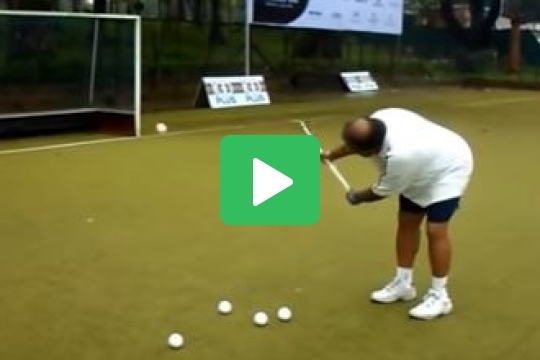 - one can move either way to the right or left, with the ball. This puts an opponent in a dilemma. 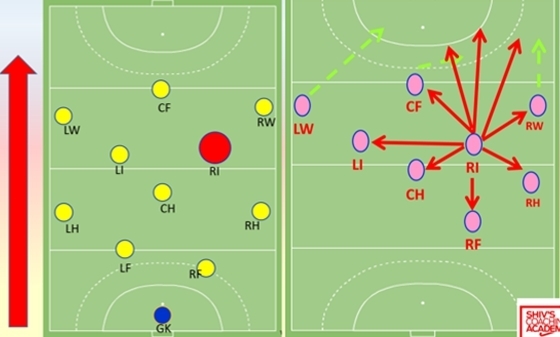 To draw the defender to one’s left side and pass it with the reverse stick, to the overlapping R.I.
To develop game understanding and specific situational tactical awareness? When the players are in their early to mid-teens, practice sessions should be designed as such which expose them to the various game situations they will encounter at the higher level of competition. The best way to achieve this is via Mini Hockey Games, 3 on 2, 3 on 3, 4 on 3 and 4 on 4. IOW train in a game simulated environment and not in isolation. Avoid drills which force the player’s to dribble and run through the cones. This is counterproductive to some extent. Just an example of 4 on 3 mini hockey game to teach the concepts of the various types of marking. Teach and expose the players to the various basic concepts which govern the game during a classroom video sessions and on the field. During the Mini hockey games, Freeze the Game and ask the players open ended questions. Covering 5 W’s and H regarding the given game situations “using guided discovery method”. As this will help the coach understand the player’s perspective, level of thinking and how they see and read the game situation. Develop success from failures. Discouragement and failure are two of the surest stepping – stones to success. Failures are part of life. If you don’t fail, you don’t learn. If you don’t learn you will never change. Success is not final, Failure is not fatal: It is courage to continue that counts. I have missed more than 9000 shots in my career. I have lost almost 300 games. 26 times, I have been trusted to take the game winning shot and missed. I have failed over and over and over again in my life. 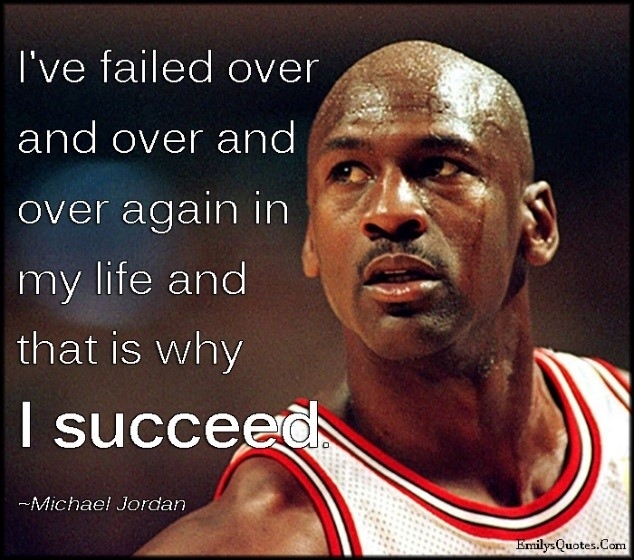 And that is why I succeed. The Biggest risk is not taking any risk. In a world that’s changing really quickly, the only strategy that is guaranteed to fail is not taking risks.